Augmented reality is the next stop on the high-speed tech train. 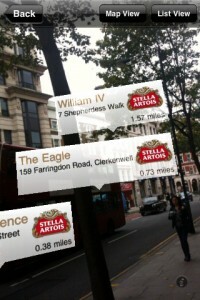 AR embeds information into images from the world around you. Focus your phone camera on a book cover, and Amazon’s Flow app will show you a description and allow you to buy it direct from Amazon.com. Yes, I know, the book’s in front of you, so it seems silly, but imagine how you might use this for larger objects or photos of items for sale in the newspaper. Or perhaps that cute pair of shoes your friend is wearing. Stella Artois’s Le Bar app allows you to point your phone down a city street and find all the bars serving its beer. In this TED Talks video, Matt Mills of Aurasma demonstrates how his AR app can bring inanimate objects to life. He points out some compelling uses in education and customer service – for example, setting up your router, and for reading the newspaper. Point your camera at a sports photo and it instantly animates into the latest video coverage. It’s easy to imagine AR’s utility in marketing and PR. A wealth of information can be attached to buildings, people, places, objects, images and more. That information can include one-click purchasing, product information, client testimonials, reviews and so much more. It’s worth noting that much of this can be accomplished with QR codes, but AR will likely streamline the process (no need to create a QR code) and make the information more easily accessible. After all, your friend’s cute pair of shoes wouldn’t be as cute if they were stamped with a QR code.